"Patty Jamieson and Thom Allison are deliciously toxic as the Count and Countess trapped together in a marriage where pain provides their only pleasure." "Thom Allison... plays the Count, Fredrik's even-more-married rival... his head-notes are thrilling." "Goldie Semple shines as Desiree Armfeldt, who is carrying on an affair with Count Carl-Magnus Malcolm, played magnificently by Thom Allison, whose voice is among the cast's finest." 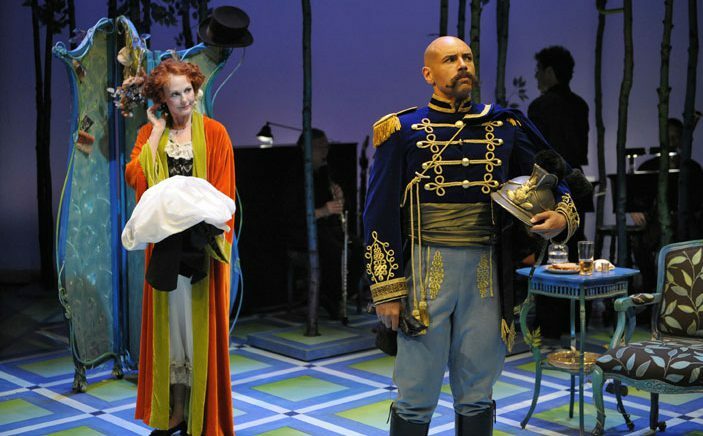 "Thom Allison has some terrific comic moments as another of Desiree's conquests, a strutting blockhead who is as jealously possessive of Desiree as he is of his own wife's virtue"
"The acting itself is whimsical and entertaining, drawing the audience in with repeated laughs while tugging heart strings with the complexity of love between the characters. Most entertaining was the interaction between Carl-Magnus (Thom Allison) and Fredrik (George Masswohl) over the affection of Desiree (Semple)." "Unfortunately the Shaw production takes most of the first act to attain any kind of comic or musical energy. When it finally does so it is largely due to the entrances of Thom Allison as the wild-eyed and comically charismatic Count Carl-Magnus Malcolm and Patty Jamieson as the hesitant romantic rebel Countess Charlotte Malcolm. As one of three somewhat misguided couples, both performers possess the ability to strike a delicate balance between the comic play and romantic drama the show requires. Their musical prowess beautifully conquers the very challenging, almost dissonant recitative that the score relies upon."